Its a bad sign when a lawsuit begins with executives warning one another to only communicate “verbally, since I don’t want to create a paper trail over which we can be sued later.” Well, that’s a bad for defendants — but a good one for plaintiffs. In this case, the plaintiffs are 64,000 employees from Google, Apple, Adobe and Intel, claiming three billion dollars in damages – as the biggest employers in their industry made deals on recruiting them. And the unwise executive who wrote “shh, don’t write about this” in an email, was Eric Schmidt, CEO of Google. Since anti-trust rules could qualify in this case, the plaintiffs would qualify for triple damages on any winnings. That’s up to $9 billion, or $140,000 per class member. Or as I now think about such numbers, 80% of the market cap of Tiffany’s. I’ve been using Tiffany’s a handy yardstick for some time. Take Airbnb, its projected valuation is within 10% of Tiffany’s. So, seriously which would you value more? The company full of diamonds that is exquisitely branded, or the one that rents out other people’s flats and sofas to strangers? See how useful Tiffany’s can be? Settling was an easy call for the ridiculously guilty appearing firms to make — resulting in a pay out in the area of $325 million. That’s about 5k per plaintiff, less legal fees. Close to the value of 1-800-Flowers.com rather than the diamond store. Why risk springing for diamonds, when sending flowers is cheaper and easier. Settlement or not, Google need to grow revenue – look whose business they’re looking to take next. Is Google ready to grab business from its best advertisers? Yep! 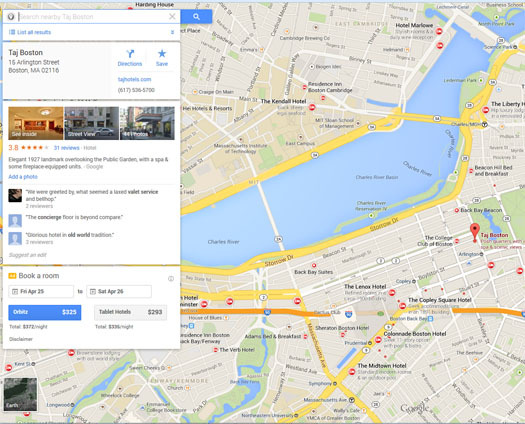 Not long ago, Google revealed that it will create market place ads that sell hotel reservations inside of its Google maps search results. They’ll provide slides shows, reviews, pricing and do a lot more to close the booking on their own pages — which cuts out the likes of Priceline, Expedia and TripAdvisor — who currently get a cut of up to 25% on the sales they make. What if Google just skipped the middlemen, and put their own buy button on their search results? Apparently, that’s the plan. What makes this a guts move is that this year Priceline will spend over $1.5 billion with Google advertising and Expedia could spend another $1 billion, mainly to attract hotel bookings, says RBC Capital Markets analyst Mark Mahaney. These two alone are estimated to account for nearly 5% of Google’s ad revenue. That’s not a call an organization makes easily. Can you imagine writing that business case, in which you’d imagine levels of traffic, conversion rates and marginal return? It would sure help if your firm had analytics code running on those firm’s pages, so you could model conversation rates. You could even test ad units efficiency before making such an announcement to “smoke test” that this plan would work. Of course, Google says they don’t use their client’s analytics to inform their business planning. After all, that would be evil and it would almost certainly trigger anti-trust concerns. Honestly, I really enjoy many of Google’s fine products. And I certainly revere them over complete industries that seem out to screw their clients with obfuscated pricing, ill-considered products and intransigence to innovate. The problem isn’t that Google is evil, that problem is that it is big and able to influence lives and their conduct on a huge scale. It would be interesting to graft in some of the modest and social conscience of Ikea’s corporate culture, which takes root from its incorporation as profit generating foundation. Evil or not, Google is fearsome. Its staff, Priceline, Expedia and TripAdvisor know this. Sure they still work with Google. That’s the point — we’re most vulnerable to those we depend on and perhaps already trust too much. 1 Response to "Google’s “Trust Issue” Isn’t Good vs. Evil – Ask the Clients and Staff Who Fear It Most"
Online Marketing Institute and Google do a masterful job of explaining why we are at the start of a new era of radically increasing standards of living throughout the world. About your article is essential reading for anyone looking for a better tomorrow.